The Radionic Ships of the Heavenly Host | Lower Cloud Reflections. 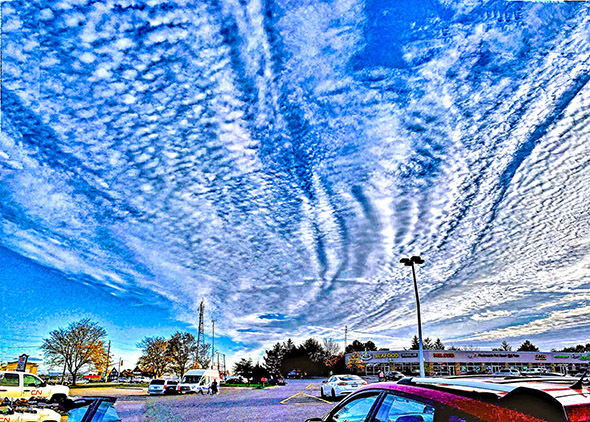 Lower cloud reflections are basically Radionic Fields which are visible in cloud layers lower that the assorted Cirrus type layers. The same Radionic Field will look different from one cloud layer to the next. Another reason for so much variation. As previously stated, Radionic fields come in all kinds and all sizes. Bing Search offers well over seventy different types of clouds, some having simple intuitive names like 'Cirrus Fibratus Radiatus' and 'Kelvin-Helmholtz Clouds'. Radionic Ships can show up in any one of them. As you have been shown, different kinds of Radionic Ships produce completely different kinds of Radionic Clouds. Throw in the different type of cloud covers and you get completely different variances of Radionics fields yet again. Yet all are according to kind. Given ordinary third dimensional local environment differences such as Sun, wind, local Earth magnetics, and time of day and you get even more differences yet again. Remember too as has oft been said, that you never get the exact same thing two tics in a row and you will never see a limit to what kinds of things you might see. In particular, you will see Mother and Father Ship field effects in the lower cloud atmospheres more often than Anchor Ship fields. The image below, while obviously not in the higher cirrus clouds still bears a strong Radionic presence. A Father Ship Cloud sits boldly up the middles and a Mother Ship Cloud sits at the lower right. Some criss crossing interactions appear at the lower right. Interestingly enough, the Field above the Father Ship splits up into three bands of very definite Mobile Scout Ship activity in the lower Cirrus cloud levels. The next Figure below, from Figure 6a in Starrgram 7 is interesting for a number of reasons. First as mentioned, it is at one end of a miles long union of a Mother Ship and Father Ship sitting tight side by side end to end like an Androgynous pair in a full Radionic field provided by an Anchor Ship Pair. The end shown below, reflecting in an upper middle cloud layer is right at the apex of the Positive pole end of the environment which has been partially dissolved by dry air on the right. The other end of the pair, Figure 6b in Starrgram 7, and photographed one hundred and eighty degrees in the opposite direction sits right over the Negative pole end of the environment. Dry air, this time coming in from the left, likewise has dissolved the left side of the field and also part of the Mother Ship part of the partnership until about a third of the way back to the other end. The parallel pair of Ships hung very low overhead and filled the sky like a gigantic long dirigible from one end of the environment to the other. Nothing like this had ever been seen before by this wordsmith or since. The following Figure off the Internet is similar to the one above having a lot more overcast and single a Negative Pole Anchor Ship Field. The rule is that just about any kind of Radionic Ship can show up in just about any kind of cloud of the conditions are right. The proof of the pudding is the Figure below taken again by the Winnipeg friend of the Cause during a Newfoundland holiday in June 2018. The photo was taken new Norris Point, Newfoundland on June 27, 2018, featuring a really big lower cloud Saucer Shaped Mother Ship condensate putting out a big lower cloud Mother Ship Radial pattern, which is its give away. This is about as sic, 'Bare faced in the noon day sun' as it gets. Unlike most of the images so far in this Revelationnum, to the untrained eye there is nothing unusual whatsoever about this photograph. Like the Wall Mart at the Mall, it could be in any city anywhere in the world and nobody would think anything more about it. Let's face it, if you didn't know about the Radionic stuff going on you wouldn't have a clue that something was going on, and wouldn't have any way suspecting there might be. Perfect. However, if someone were really sharp, they might notice the slew of Radionic Mobile Scout Ship condensates at the middle and upper right plus upper left. Figure 5 - Been doing this like forever. The next photograph is five for the price of one. One cloud level is real low, the second is only a little bit of cloud sitting low at the bottom middle. A third just above that is also not wide spread. The fourth is a fairly normal cloud layer blanket hanging quite a bit higher in the background, between the rolls. And the fifth is higher atmospheric haze covering wall tot wall above that. Nice catch. Notice that the Negative Pole Radionic Field is much the same type as Figure 6 in Starrgram 2 and of course Figure 4 above. Notice also that the two main roll clouds along either side start from the apex area. The photograph was taken just outside Medicine Hat on April 20, 2013 by the Medicine Hat friend of the cause. In case you haven't done the map yet, Medicine Hat is at the bottom South East end of Alberta at the beginning of the Prairies. Now here's where the nitty gets nifty. Did you ever wonder how the Medicine Hat friend of the cause managed to get such good photos all the time. It's been said earlier that the secret to getting a good Radionic photograph is a combination of being outside, seeing a good sky view to capture up there, and having a camera or cell on hand to do it. There's nothing better for being on the outside part than a Railroad Engineer running a flat route across the prairies. Our friend of the cause held his 'Casey Jones' hand on the throttle daily between Brooks, Alberta and Medicine Hat for years. This was great. Whenever there was anything up there really great he saw it. He didn't even have to step out further than the cat walk aside the engine to get a great shot as the Figure below clearly shows. He finally got the buzz to start taking pictures in 2012. Figure 6 - Merrily we roll along roll, my fair Laddie. The above may be down and around right enough, but nothing gets the low down better than the one below. It also shows the portion of the ionnic Negative Radionic field above it which is influencing the cloud layer below. And which hasn't been dried away yet by the higher level incoming dry air from the left which has evaporated most of the upper Ionnic field at the left. You can expect that something like this is at work in all of these low cloud formations. Namely, ionnic formations above induce matching Radionic patterns below. Figure 7 - You've all heard of the Airie Faerie, well here's the Fairly Airy. Likewise, Mother Ships can force tube like ionnizations into the lower cloud layers such as the following photograph from Ottawa, Ontario clearly shows. The photograph was taken by the Ottawa friend of the cause, on July 10, 2016, looking to the North West at sunset. Making it a pretty good Kodak moment. Figure 8 - I'd like two Big Macs and a Graval please. 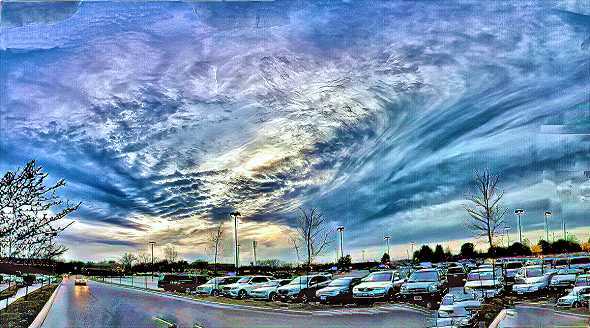 A very filled in Mother Ship Cloud effect from off the Internet shows an even lower level of overcast sky interaction. Figure 9 - I can do the whole sky anytime I want. Think I'm kidding look again. The same thing can occur in much thinner tubulations. The following is again from the Internet, showing the exact same type stuff both front and back as the above Figure only daintier and farther reaching. The photo also helps to show that unlike Anchor Ship Radials which usually extend from one apex into the other, Mother Ship radials tend to eventually zone out. 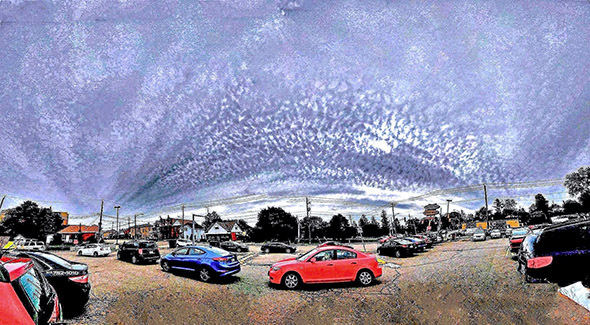 Then on a very blustery day on September 20, 2016 back in Brantford again, along came a Mother Ship sitting in a very tempestuous lower cloud layer sitting low just above the Super Market in the Figure below. The Ship is only about a kilometer wide. The view was to the South East. The Ship was not the cause of the blustery weather. The whole South West end of Ontario had been sore beset by the weatherman for a couple of days. The weather wasn't being kind to anyone including Radionic Fields. Likewise, the field was a Will o' the Wisp. The Mother Ship field visible for less than ten minutes. The clouds with the right reflective ingredients for showing the magnetics were quickly blown along. It doesn't take a very big hand on a calculator to realize that this one was in pretty close. The next photograph is a very similar Brantford photograph to the one above, taken on May 11, 2018, only about two blocks away from the FRESHCO plaza. The location was the same open viewing ground and looking in the same direction as Figure 20a in Starrgram 4. Despite the similarity to the above, there is much more of a kinship to Figure 44 in Starrgram 7 going on here because of the number of Ships involved. The Figure below has eight, the one in Figure 20a has only two, Figure 44 in Starrgram 5 has at least five. There is also a bit of a story with this one, there's always a story. When leaving the FRESHCo Super Market, an exit to the right of the Figure above was taken looking right at a few frilly whisps high in the sky ahead. Thinking first to wait a bit and let the formation firm up first, then remembering a few times that the same idea had came up and hadn't worked out so well, a quick turn was made into the open viewing parking lot across the road to take the Figure below as a precaution. The Super Market plaza was no good for the photo because the parking lot is ringed by big box vendors partially blocking the view. Well done it turns out. Intuition had prevailed. Ten minutes later the sky was nearly smoothed over, Twenty minutes later there was no sign that anything had ever been present. As earlier stated, Mother and Father Ships always project in pairs, sometimes close together and sometimes far apart. In this amazing photograph all but one pair are close together. The First Father Ship showing is a thin horizontal almost condensated Father Ship Field like Figure 45 in Starrgram 7coming in from the tree at the lower left. The second is revealed by frillies near the top left just right of the weird lamp standard at the forefront of the picture. Remember that no matter how wild and wooly the foreground may look, the sky is not affected because it is so far back. The third is the frillies from a small Father Ship sitting just above the white truck in the center bottom. The fourth Father Ship was is one across the middle right behind the light white cloud patch, whose main frillies show was out the top beyond the scope of the picture. This fourth was the one that got this whole thing going, because it was a whole wide wall of frillies that went straight up overhead like a huge wall to wall fan that was just barely visible, and not visible in the below at all for being above the cut off at the top. But they were the Radials originally noticed and not the Mother Ship tubes, which ended up being the most dominant aspect after processing. As has been mentioned before, seeing something in the sky is one thing, seeing it in a photograph later could be a something completely different later. Similarly, the quality of the foreground tells you it was a pretty good photograph. The quality of the sky tells you it was pretty cloudy overhead. Figure 12 - Busy is as busy gets. Another low cloud Mother Ship reflection within a Negative Anchor Ship field appeared at dusk in Brantford on May 20, 2016 looking to the North West. Previously shown as Figure 15 in Starrgram 5, it has a very obvious Mother Ship rack reflection like Figure 28 in Starrgram 7at the lower left, and a not so obvious Father Ship reflection slopping upwards at the center right in front of the rack cloud extension. The cloud opening in the middle shows that there are three more successive cloud layers higher up after that. Radionic fields will look different from one cloud layer to the next, another reason for so much variation. Figure 13 - I am the eye in the sky, ooh ooh ooh. Like Figure 49 in Starrgram 2, the Figure below has been pulled out from under the unfriendly invisibility of a heavy cold overcast cloud cover. Photographed in Brantford on September 27, 2018, the Figure takes a somewhat similar type of Mother Ship rack as the above and puts it in a completely different type of setting. The sky was nearly completely covered by the low overcast, with, like Figure 13 above the Radials just barely showing through. The Figure features an Anchor Scout Ship Radionic Arch running wall to wall from a nicely visible Negative Polarity Field at the left, to a somewhat visible Positive Pole Field at the right. The main player is a Mother Ship Field coming out of the page towards you from the right, almost at a right angle to the arch. The end result is that the right side half of the photo is the Mother Ship Field and the left side half is the Anchor Ship Field, nicely parsed. Figure 14 - Praise the Lord and pass the parsley, we've been properly parsed. In a calmer note than Figure 11 above, the Figure below has lots of bluster but not so much rip snort. This time a Father Ship is sitting horizontally from the lower middle to the lower left. And a much wider Mother Ship sits almost all the way across above it in the middle. Their two are pushing the clouds up all over the place. Taken at the north end of Cambridge, Ontario on the 17th of July, 2016, the view was, you had to guess, to the North West. Unlike some of the photos in this Revelationnum, the curve in the forefront is not a result of the type of photographic drama involved, the highway actually curved just like that. The clouds above the middle show influences of both the Father Ship and Mother Ship Fields combined. The large Mother Ship tubes across the top are obvious. Not so obvious are the couple of Father Ship car like grills similar to Figure 2b in Starrgram 4 within the upper left blue area. Figure 15- I'm feeling a little under the weather today, maybe something in the weather. Likewise, in an abrupt change of pace, as Figure 11 above showed stormy stuff can get into the picture. So can actual storm stuff. The following Figure is of a Negative Pole Radionic Anchor Ship Cloud just getting going covered in front by a small rain cloud just getting going. The picture was taken by the friend from Hunstsville on August 27, 2017, in Sedona, Arizona. The chances are good that if you pulled away the front cover, the Field would end up looking just about the same as Figure 7 of Starrgram 2. The way you can tell it's a true Radionic event and not just merely a little shower on the brew, is the bevy of Mobile Radionic Scout Ships sitting at the upper left hand edge. Mother Nature can't brew those. Figure 16 - Neither can Molson's. For the record, Figure 11 above was definitely not a storm cell. The weather out was nothing like a storm brewing, just the cold winds of November come early. To see what an actual storm cell looks like passing through a Radionic Field, check out the Internet Figure below. It's what the Hippies used to call a 'Happening'. Figure 17 - Lord Tundrin Jesus Bey, me tink's we's in for a blow. The similar following photo from off the Internet shows a nearly perfect Thunder Head sitting right in front of a nearly perfect Negative Pole Radionnic Field. The Thunder Cloud this time is far enough away from the Field that there is no direct interaction with it. But look at the wall of rain. The are also Mobiles all over the place, particularly in the center top.. Figure 18 - It' raining it's pouring, the old Man is soaking. A bit more awesome looking this time, is a full length storm front interacting intensively with a full length Father Ship Field as shown below. Helping things along is a Mother Ship Field coming straight up out of the page at the far right. What's most interesting about this photograph is that despite looking like any of the joined Negative and Positive Pole Radionic Anchor Ship Fields in Starrgram 4, there are no signs of an Anchor Ship Field present in the photo. All in all a pretty remarkable photograph. One not too likely to be repeated too often. Figure 19 - Yup, definitely looks like we're in for a bit of a spat. And what Radionic/Storm Cloud interactions would be complete without a good old dust up with a patch of Mammatus Clouds. Such a dust up did occur over Monro County, Pennsylvania in the photo below from the Internet. Look up Mammatus. Looks like a friendly talking cloud from Harry Potter or Guardians of the Galaxy 2. You'll also notice that most of the big holes are filled with Mobile Scout Ships, which are in fact the holes. Neat optical illusion, eh. Figure 20 - Holy Moly, I'm not that scary. I just look that scary. And who can forget the double Mother Ship effect in Figure 38 in Starrgram 7. What probably wasn't noticed is that it was in an upper cumulous cloud layer. Visible Radionic effects down into the cumulous clouds levels are not that common. Like a blue moon they only show up once every now and then. 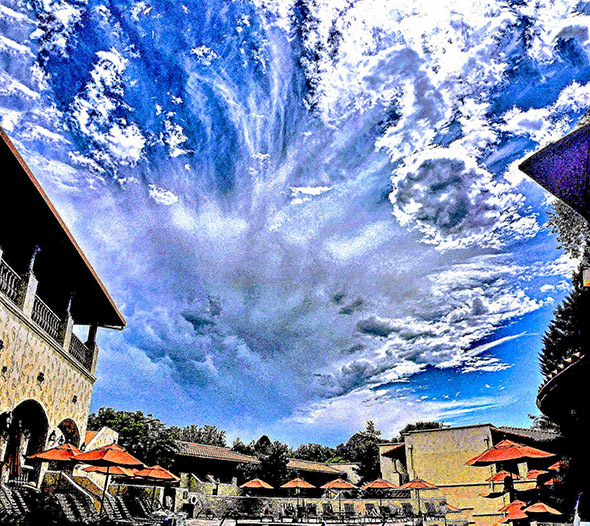 An even lower, almost 3D like photograph with a Radionic Cloud was found on the Internet, appearing in very low lying cumulus clouds as shown below. This time it is in an Asian Country but the effect is the same. The Asian Countries collectively are Earth's Root Race Adamic Evolutionaries. Buddha brought though a teaching for the Adamics which revealed their intended future. At the time the Adamics were fixated solely on their ancestral past. Figure 22 - Buddha beckons believers. To confirm the effect, the similar but decimated very low cumulous cloud view below was photographed on April 16, 2017, from the same location in Paris as Figure 12 in Starrgram 5 looking to the South West. It is at dusk again only this time earlier in the evening. As the Figure shows, a decimated Father Ship Field became plain as day even as evidence of higher level Radionic effects sat in behind. Note that the setting sun is left of the apex point. The Radionic effect was very short lived. Moments later the Radionic effect was all but gone. The validity that it is Radionic vests in the little clutch of Mobile Ship Condensates sitting just above the house with the car in front parked just left of center. The Following photo of the Supreme Court building in Washington, DC, off the Internet shows the same type of subtle Negative Polarity Radionic Field influence on a lower cloud cover as does the Figure above. The interesting thing here is that the photograph appeared at the top of the October 6, 2018, Drudge Report, front ending a press release by the Associated Press News Service that the ninth Supreme Court Justice had just been officially voted in. Similarly, the validity for Radionics vests the very faint little clutch of Mobile Ship Condensates sitting just above the meeting of the left column and the roof. Figure 24 - We say yay, yay yay and nay. On the other hand, the following Figure shows Mother Ship tendrils instead of tubes in a lower overcast sky. It was taken at the same time from the same plaza as Figure 33 in Starrgram 5, but from a different angle with a different hand on a different camera. Similarly, the next Figure is of a Father Ship Radionic Field equivalent of the Figure above, only in a very very low down cloud cover. The image was found sitting on the Internet waiting to be discovered for what it was. Figure 26- Hair today, gone tomorrow. Likewise, here's a Mother Ship doing completely weird tendril stuff, originally shown as Figure 38 in Starrgram 5, out-coming as completely weird looking marshmallow cloud blurbs. Only the upper row of blurbs is present and the Mother Ship body is not as obvious, lying unseen along under the marshmallows. Look at the blurb shadows casting down onto the overcast in back, presumably from a Sun which is up behind. Kind of hard to figure out the mechanics of that one. Figure 27 - I'll have six honey cruller Timbits and one apple fritter please. Two of a thing proves the thing. The Figure below proves the one above. This time even better with a short string of little pillows visible along the bottom of the field as well. Getting into the act also is the following Internet Father Ship equivalent of the two above shown previously as Figure 2 in Starrgram 6. In this case having no visible Ship condensation. And not to forget the Sun. As a few of the photographs in the previous Starrgrams have shown, the Sun can sometimes also have fun with cloud Radionics too. Such as with the cloudy Cumulus bits in the Figure below from Brantford on June 11, 2016. The view was to the South West. The lighted bits almost look like they are being hit by a Tesla ray. As you might expect, the Clouds pieces are frayed not because of Tesla, but because a whole fleet of Saucer Shaped and Spherical Mobile Scout Ships Condensates are in there all over the place. Figure 30 - Will you please stop pointing that thing in my face, whatever it is. A bottom part of the above was even more interesting. The first is that as shown below the above pop corn bits are actually sitting in Radials from a Mother Ship lying underneath. Second, the Mother Ship and the horizontal cloud lying underneath it look like they are being hit by some kind of molecule dissimulator. One was supposedly used on 9/11. Maybe someone forgot to turn it off. Actually, as you might also expect, the rows of soda pop bubbles along the bottom are also the result of dozens upon dozens of Mobile Scout Ship condensates. Figure 31 - Please stop with the soda pop. The above is not an isolated case, the Figure below showing somewhat the same kind of razzle with not so much dazzle as the above was found on the Internet. No high tower Trade Centers involved this time, just a nice big school of jelly fish. And you guessed it, caused by Mobile Scout Ships everywhere. Figure 32 - Thank you. Something interesting regarding the photographs has come about via the friends of the cause. Starting about three years ago our friend of the cause in Kampala, Uganda started sending photographs along. His earliest was from 2012. Similarly, starting in the late spring of 2016, our friend of the cause from Huntsville, Ontario also started sending his stuff along. His earliest was also 2012. Likewise, in late October of 2017, the friend of the cause in Medicine Hat began forwarding his collection, which also started in 2012. There seems to be a pattern here. It looks like 2012 is when the Radionic Fleet decided to initiate their plan for the whole World to know about their existence by starting to cue up those in the vanguard by intuition in 2012. In any case it's now officially on. This Revelationnum is patent proof of that. There are no doubt many such good examples waiting to be discovered going all the way back to the early fifties now that you know what to look for. Check some of your old photos, you might be surprised. If you should spot such a Radionic Field, or spot one in a movie or TV or on the web, It would be greatly appreciated if you could send a link or an attachment to the email address below for inclusion in this and later additional versions. Likewise obviously, any Radionic Field you might see overhead some day and are able to photograph. Don't forget to do a sweep of clicks for side to side to get as much in as possible. Also don't forget to check in the opposite direction to see if an opposite pole partner is also present. The more the better, since every example further goes to exemplify the principle.